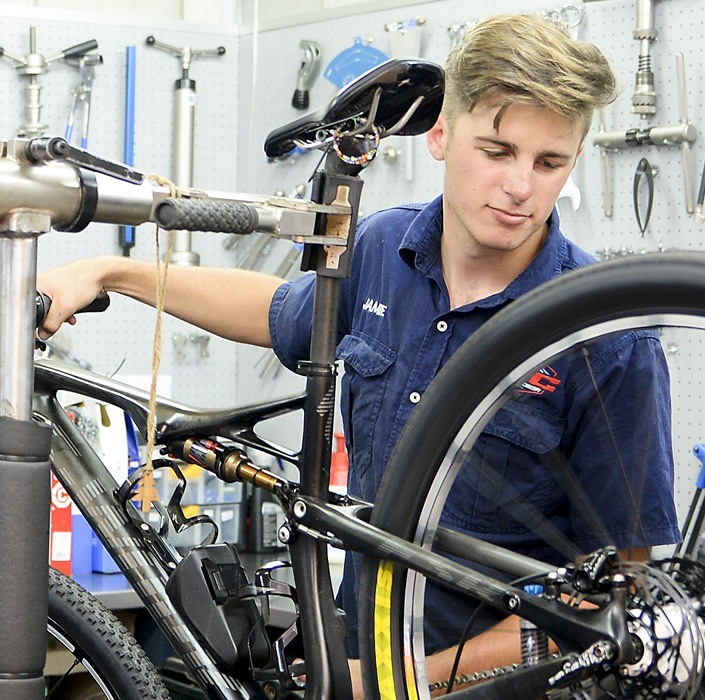 Daniel Ngulube and Andrew Haylett working to ensure you and your bike get the best possible service. Mountain biking is not a cheap sport and by keeping your prized steed in tip-top shape would not only be beneficial to its longevity but it will also ensure you reach the finish line without major problems. 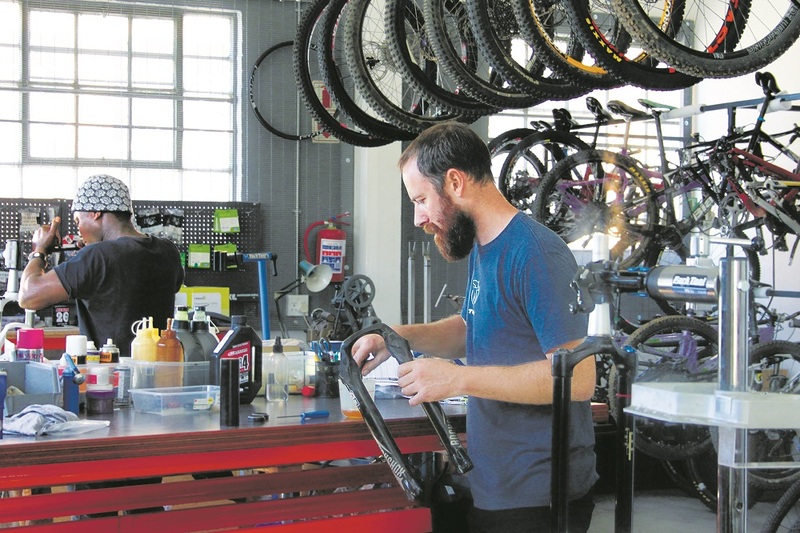 Regular contributor and bike shop owner Stirling Kotze (senior) explains why servicing is important. As a bike owner, you may have asked yourself this question after you’ve coughed up your month’s entertainment budget on your bike’s service. Truth is, its unlikely you’ve paid too much for your service and replacement parts. Feeling ripped off and being ripped off are two different things. Feeling ripped off has its roots in poor communication between you and the guy checking your bike in. He must tell you everything you need to know about your bike’s condition and what could need replacing. Your role is to ask the right questions and ideally give the workshop a reasonable mandate on what is done or how much to spend. But let’s go a step back. The check-in process has to be thorough. The so-called M-check. → Back wheel. Tyre condition. Hub. Spoke tension. Pivots. Brake disc. Cluster. Freewheel body. → Rear shock – action and wear. Seat post or dropper post. Saddle. → BB. Chainring/s. Chain. Pedals. → Cable action and routing. Headset. Stem. Bars. Shifter/s. Brake action and positioning. Grips. → Fork action and stanchion wear. Brake disc. Wheel. Tyre. Hub. Spokes. → I’ll ride the drivetrain until its dead! Your go to shop is your shop where you purchased your bike or your friendly, competent, convenient LBS. → Don’t rush the check-in process. As you observe your bike being checked-in you’ll ‘buy’ into the recommendations for your bike’s specific service requirements. If the bike shop employee doesn’t do a thorough check-in, encourage them to do the full M-check and if they don’t know what that is, get them to google it immediately. → Don’t send your spouse/ driver/PA (if you do, you have to give your bike shop carte blanche – since clearly budget isn’t your issue – or very specific written instructions which implies you know your stuff). Rewind a bit. Choosing a workshop that suits your specific bike and, of course, your budget is in your hands. If you have an older 3X9 26’er MTB rather take it to a shop that is more workshop than it is a fancy retail bike shop. If you have a brand with unique propriety mechanical design elements such as a Lefty “fork” or a Brain shock go to a Cannondale or Specialized dealer respectively. Mostly, your go-to shop is your shop where you purchased your bike or your friendly, competent, convenient LBS. Your favourite bike shop WILL make a mistake once in a while. Keep your cool, let the workshop know and give them a chance to sort it out. How they sort it out is what counts. An apology followed by a promise to sort it out quickly and with the least hassle to you should be your expectation. If your shop continues to mess up on a regular basis find another workshop. But you must be honest and ask yourself if you were to blame in any way. Rewind even more. If you’re about to buy your first real bike remember to ‘buy’ your shop before you buy your bike. You buy your shop based on proximity and convenience, the brand/s you’re interested in but most importantly on the vibe and personality of the store and the people in it: a place where you feel comfortable to pop in for a bike-candy fix, some advice, a coffee and a chat. It’s a fact of life: the better your mutual relationship is, the better you and your bike will be looked after. Each shop has its own positioning, offering and bias toward specific biking disciplines. Owner-run stores are arguably better run stores in terms of delivering service and shortcircuiting decisions – when you have an issue it’s often best to take it up with the owner. It is also good to know that the shop’s staff and management/ owners are cyclists – or, even more important, they love bicycles! BYO … CORKAGE OR NO CORKAGE? How should you expect your bike shop to respond to you bringing in your own upgrades and spares (usually purchased online) for them to fit? Typically, they won’t be ecstatic about it, but if they are professional they will bite their tongue and just charge you to fit the stuff. One must remember that the shops are investing in large quantities of stock in order to carry the numerous upgrades and spares needed by the huge variety of older and modern bicycles out there. So first off you can expect to be charged a labour fee to fit the parts (most often when you buy the upgrade from the shop, they will fit it for free). Don’t expect preferential or reduced labour fees if you bring your own parts, but most importantly, if you have purchased the incorrect part, it’s unreasonable to expect the shop to trade it in or swap it out for the correct part. Unfortunately, that is the big risk you are taking for purchasing the parts and upgrades cheaper online, and not through your LBS. There are some miserable workshops out there and there are some really difficult and/or entitled cyclists around. It’s just a shame that the cycling gods can’t direct these guys to each other! The majority of shops and customers are happy, passionate people trying to look after each other. We share a really fun, cool, stoked activity – riding our bicycles, feeling like teenagers. And best of all, there is usually a coffee or a beer (or two) at the end of this particular riding rainbow. These simple tasks will save you a wallet-load of cash in servicing and repair fees. Rather use your cash for cool upgrades like 1×12 drive trains and dropper seat-posts! 1 Clean bike, happy bike. Followed by a quick frame check. 3 Correct tyre pressures on EVERY ride. post of dust and grit. 5 Keep and eagle eye on your brake pad wear. 6 Buy a chain-wear measuring tool and use it regularly. 7 Do your own M-check once every few months – you’ll develop a great feel for your bike’s health. 8 Top up your tyres’ sealant regularly. 9 Don’t ignore your bike’s clicks, creaks and screeches! 10 Do a bolt, pivot, screw, thru-axle, skewer check every couple of months. They have a sneaky way of loosening themselves!